The eMinutes Communications Center is accessible from your online portal. All communications from eMinutes are captured as messages in the Communications Center. 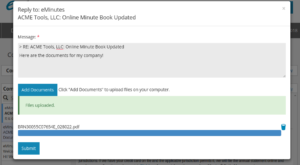 From the Communications Center, you can control the way we communicate with you and communicate with eMinutes securely. 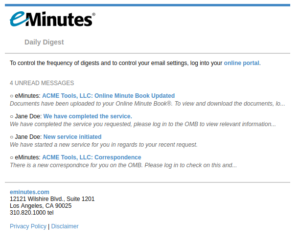 eMinutes can send you individual emails or Daily Digests of our communications. You can turn your emails on or off and select the days of the week you would like to receive a Daily Digest. The main navigation bar in your online portal will indicate the number of unread messages in your Communications Center. 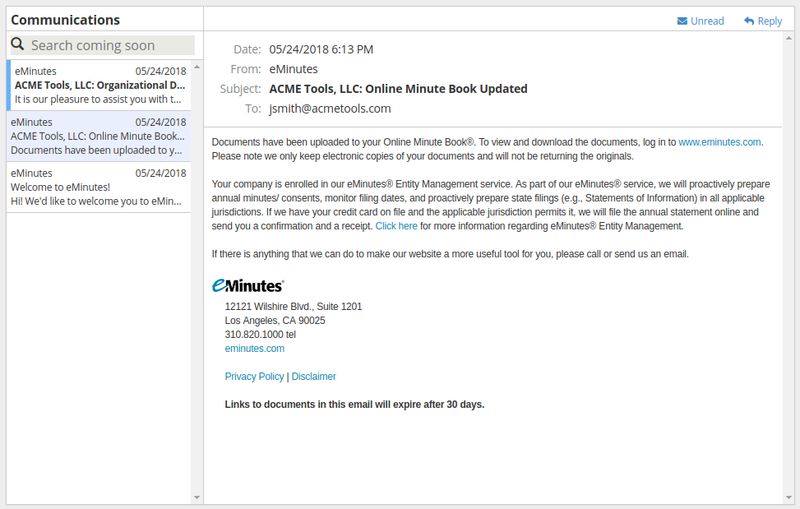 Replying to messages in the Communications Center is a secure way to communicate with eMinutes and a secure way to upload documents since it goes directly to the eminutes server and all data transmission to and from the eminutes server is secured via SSL encryption. The Daily Digest will summarize all communications and unread messages.